Contains two pairs of ultra comfort insoles. Extra comfort for everyday shoes. Destroys odour on contact & absorbs sweat. Everyday wear. One size fits all. Long lasting protection 4 months guaranteed!.Ultra Comfort insoles are specially designed for Everyday Shoes. When you wear shoes day after day, odour and wetness can build up. 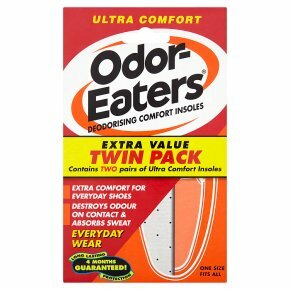 The thin, flat design of Ultra Comfort insoles cushions without crowding in the shoe, and a powerful combination of technologies provides superior odour and wetness control that lasts for months: Odor-Eaters Triple Odour Protection...specially designed for men's and women's everyday shoes 1. Activated Charcoal locks in and destroys odour for months. 2. Insta-Fresh®instantly neutralises sweat acids that release odour. 3. Powerful Anti-Bacterial Agent fights odour-causing bacteria. Plus special Comfort-Grip Foam won't slip, won't slide or bunch up. Also absorbs perspiration keeps feet dry and comfortable. 40°Hand or machine wash Do not tumble dry Dry flat Wash separately (delicate cottons) Spin dry. Do not leave on radiators. One size fits all up to UK size 11 For an exact comfortable fit, follow the printed guidelines on the insoles and cut to fit men's, women's or children's shoe size. Place in shoes fabric side up.